LANCASTER—Dallas County Promise will host its first student leadership summit on Monday, Feb. 5, at Cedar Valley College. The program seeks to increase college completion aligned with the North Texas job market. More than 200 students from area high schools, colleges and others have been invited to attend the summit. The event will focus on postsecondary attainment, economic opportunity and poverty in Dallas County. 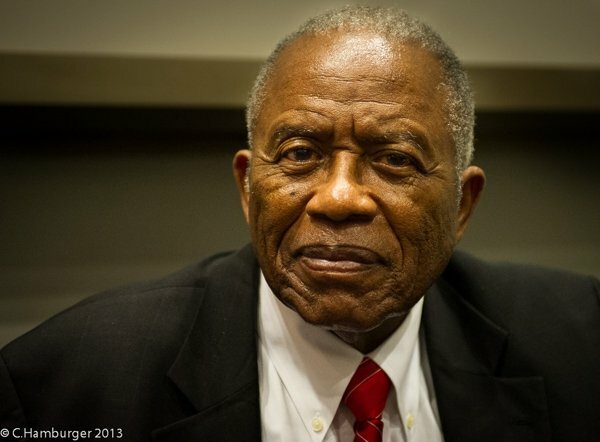 Civil rights leader, attorney and activist Fred Gray is the featured speaker for the event. Gray will discuss the role of young people in the past addressing the issues of college access and economic opportunity. Taking place in Cedar Valley’s Performance Hall he will emphasize the continuing need for student leaders today. Among his many accomplishments, Gray worked with Dr. Martin Luther King Jr. and defended Rosa Parks. He has argued cases before the Supreme Court and, at age 87, continues to take legal cases. After learning from and interacting with Gray, students will break into small teams to discuss action ideas and suggest ways to make college completion possible for themselves and others in their schools and communities. Students from Phi Theta Kappa chapters at all seven DCCCD colleges will lead the students in that discussion. PTK is the largest academic honorary for two-year colleges in the U.S., and DCCCD members helped plan and organize the summit, which occurs during Black History Month. Dallas County Promise which began in fall 2017 to help drive equity in college and economic outcomes across 31 high schools, representing 9,300 high school seniors. This transformational effort between school districts, colleges, universities, workforce and communities seeks to increase college completion and develop a pipeline of world-class talent which creates equity in outcomes for students, families and the community. Through partnerships and community effort, all Promise students have made a pledge to receive free college tuition through DCCCD. Students will have the option to transfer and earn bachelor’s degrees aligned with the best jobs in North Texas. Every student in the program will have a college success coach. The data tracking system will provide indicators that help identify needs and direct resources for Promise students. Statistically, only 37 percent of the adult population in Dallas County has a two- or four-year college degree; however, 65 percent of all jobs in the area requires some college education. Dallas County Promise will increase the number of adults who earn a college credential. While it ensures students, regardless of income, can attend college in North Texas. She added, “We can show them that the Dallas County Promise program brings education, growth and different perspectives — and those opportunities will continue when they go to college at DCCCD, UNT-Dallas, SMU, Prairie View A&M and our other institutional partners.” Dallas County Promise is a last-dollar scholarship funded by the DCCCD Foundation with matching scholarships from partner universities.